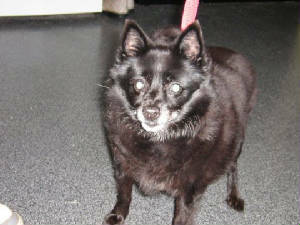 If you know of a Schipperke in the U.S. that needs to be rescued, please contact the SCA. This is Skipper....(such an origional name). She is with me now after being bailed out from the Westport Humane Society. She has been there since May! I was quite surprised to see how active she is for a mature lady and has no medical problems. She is up to date on all her medical needs. She gets along with kids, cats, and dogs. They said she is 14 but I think she might be a tad younger as she is pretty active. 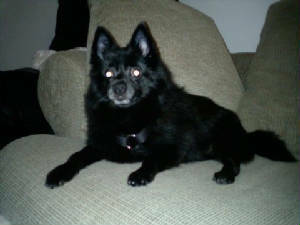 She is crate trained and housebroken and walsa nicely on a leash. She loves her chewies too! This 9-10 yr old young lady is Ebony. She was left abandoned in an apartment. She is currently with Marit. She gets along well with kids, cats and dogs too. She is housebroken and up to date on her medical. Marit says that she will also use a potty pad if you prefer. She is a very sweet girl who also is looking for a forever home.